Pomegranate juice gives this drink an enticing ruby glow and a big burst of fruity flavour. 1. Half-fill a jug with plenty of ice cubes. 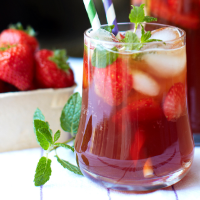 Tip in the strawberry slices and pour in the Pimm’s, soda and pomegranate juice. Stir and garnish with mint sprigs.